Nothing new, nothing fact, nothing different. 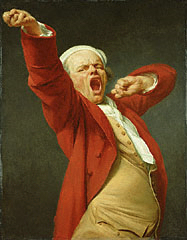 Result: ennui, followed by pandiculation and into the arms of Morpheus. Evening Independent (Massillon, Ohio), 14 Oct. 1931. It comes, as you might guess, from Latin — from pandiculatus, the past participle of pandiculari, to stretch oneself. The ultimate origin is the verb pandere, to stretch. That verb has also given us expand, plus some other much rarer words. Time, 20 Apr. 1942. Gull is in the sense of a person who is fooled or deceived, a slang term dating from the sixteenth century whose origin is unknown, but which is the source of gullibility and gullible.